Situated within walking distance of tube and railway stations, the Ikon development consists of one-, two-, three- and four-bedroom apartments in three blocks surrounding an area of green open space. Daniel Williamson, head of sales for Bellway South London, says: “Croydon is the ideal spot for commuters and young professionals, which has been reflected in the demographic of our buyers at Ikon so far. Kitchen: With tones of calm grey and soft tan taking centre stage, the kitchen has been designed to be the ideal place to unwind after a long day. Sleek glossy cupboards offer a modern feel for an uncluttered and relaxing cooking experience, offset by leather accents and leafy plants which bring a more organic atmosphere. Hints of black in the dining table, desk and coffee table punctuate an otherwise soft colour scheme, ensuring that the design is memorable and modern. Bedroom: A theme of restful colours and worn leather and wood is once again punctuated by black accessories in the bedroom of Bellway’s apartment, to create a relaxing look. Modern meets vintage in this room, with a sleek black bedframe juxtaposed against a vintage-look wooden chest-of-drawers and bedside table. An unusual light fitting is a great focal point above the bed, which is dressed in crisp white linen and soft tan cushions. 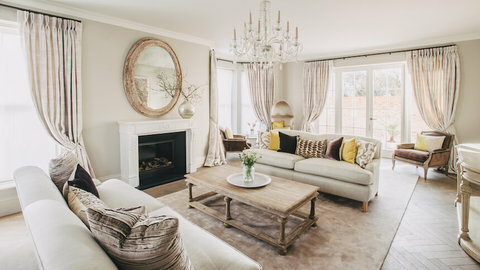 Living room: A vintage tan leather sofa is the perfect centre point for the living room, piled high with inviting cushions in a contrasting shade of soft blue. A ladder-style desk provides handy display shelves as well as the ideal space to put a laptop for those times when you need to work from home. Covering most of the living room floor, a soft grey rug is homely and welcoming, while pale brick-effect wallpaper lends an industrial feel. Bathroom: White, grey and black combine in the bathroom to create a monochromatic look. Leafy plants and a wooden bath tidy give a subtle glimpse of colour in an otherwise clean and modern room, while fluffy grey and white towels are inviting. Carrying the theme through from the rest of the house, flashes of black create a grown-up atmosphere. Details: It’s all in the detail at Ikon. The little touches help to give this show apartment its grown-up atmosphere – from the leafy plants to the wooden tray complete with teapot and earthenware mugs. 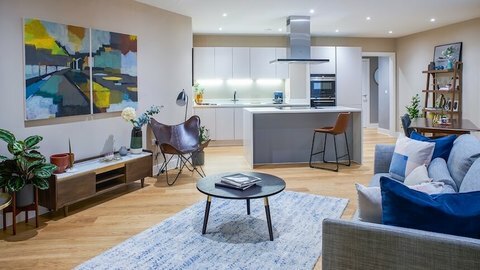 The apartment has been designed to offer the perfect haven after a long day at work, but within easy reach of all that London has to offer. 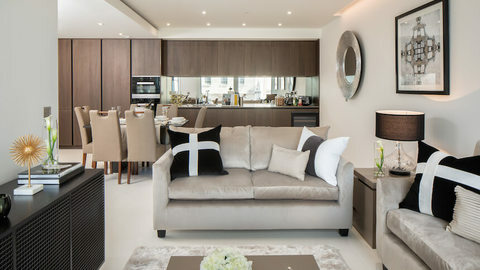 Prices at Ikon start from £335,000 for a one-bedroom apartment. For more information visit bellway.co.uk.